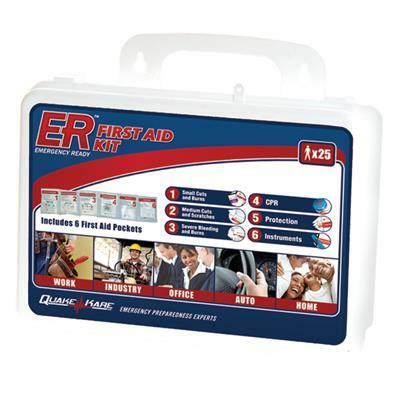 This ER™ EMERGENCY READY First Aid Kit is designed to provide basic first aid for offices or groups of up to 25 people. The ER™ EMERGENCY READY 25 Person First Aid Kit exceeds OSHA/ANSI/ISEA Z308.1-2009 TYPE III STANDARDS & REQUIREMENTS for work sites and offices of up to 25 people. Ideally suited for work, industry, school, or home use. Packaged in a durable plastic case with carrying handle and inner gasket for a secure seal. Critical emergency first aid supplies are organized in quick and easy to identify and access pockets. This comprehensive first aid kit contains recommended emergency first aid supplies including medicines, instruments, protection, dressings, bandages, and antiseptics. This kit is designed to treat injuries ranging from profuse bleeding to broken bones and burns to minor soft tissue injuries. It includes antiseptics and antibiotic ointments for cleaning and treating wounds, creams for burn relief, an assortment of sterile dressings and bandages for treating open wounds, a triangular bandage/sling for immobilizing limbs, sterile eye wash and pads, scissors and other first aid procedural tools are among the many items included in this comprehensive First Aid Kit. Store this kit strategically in a centrally located area or with your disaster preparedness supplies. This kit is ideal for classrooms, offices, school fieldtrips, sporting events and camping. This kit is recommended to use with the ER™ EMERGENCY READY CPR Bloodborne Pathogen Kit. Restock used supplies with the ER™ Easy Replacement First Aid Pack.